One of the questions that I sometimes made to myself when first studying calculus was: why the natural logarithm is "natural"? One of the reason it is called natural is the simplicity of the formula for the derivative of ln(x). The formula for the derivative of ln(x) is not at all obvious. We know, because of the power rule, that the derivative of a polynomial is a polynomial. We also know we can obtain negative powers of x as derivatives of other negative powers of x. To see what I mean, look at the following equations. In these equations, I just applied the power rule. We can see from these equations that we can obtain any positive power of x as a derivative of a simple polynomial function. We can also obtain almost any negative power of x in this way. Now, what is the function whose derivaitve is x-1? We will show that this function is ln(x). That is, we'll prove that the derivative of ln(x) is x-1. We'll use a graphical method for the deduction of the derivatie of ln(x). For that, we'll use the geometric definition of derivative: the slope of the tangent line. We'll begin with the graph of ex. To construct this graph, we first note that e0=1. So, the point (0,1) is on the graph. Also, as x approaches +∞, ex also approaches +∞. And when x approaches -∞, ex approaches zero, because in this case it equals 1 divided by a very big number. When y approaches +∞, we have, by the equation above, that ex approaches infinity. 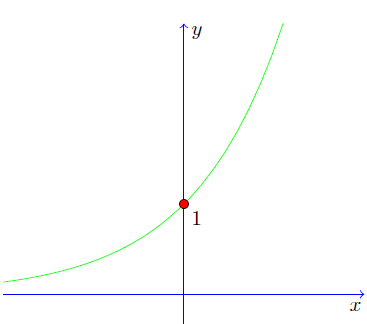 But by looking at the graph of ex above, we see that this only happens when x approaches +∞. So, we deduce that ln(y) approaches +∞ when y approaches +∞. Now let's observe something interesting. The graph of ln(y) is the same as the graph of ex, but somehow reflected. This is because ln(y) is the inverse of the exponential function. With respect to what line is the graph reflected? If you look closely at the graphs, you might be able to realize that they are reflected with respect to the diagonal line on the x-y plane. That is, the line y=x. This means that to obtain the graph of ln(y), we just need to draw the graph of ex, draw the diagonal line on the x-y plane, and imagine that this line is a mirror. The reflection of the graph of ex will be the graph of ln(y). Now, let's return to what were trying to do. We want to calculate the derivative of ln(y). To do that, we need the slopes of the tangent lines. 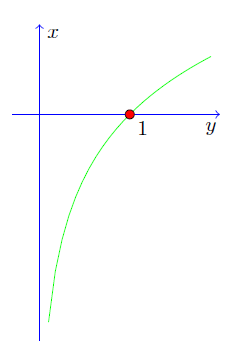 Now, as the graph of ln(y) is the reflection of the exponential function, its tangent lines will also be reflections. This means that the tangent line to ln(y) at any point is the reflection of the corresponding tangent line to ex. It is possible to prove, using simple geometric arguments, that the slope of a reflected line is the reciprocal of the original slope. That is, if the slope of a line is k, its reflection will have slope 1/k. This is all we need. Because we already know the slope of the tangents to ex. The slope of a tangent to ex is ex. That was the quick and easy graphical deduction of the derivative of ln(x). Now we are ready to apply it to calculate more derivatives. We can actually solve this problem using the chain rule. However, if we go that route, this will become a long and hairy calculation. The expression in the denominator is interesting. It actually equals cos2(x). That's all for now. At this point you already know most rules for the calculation of derivatives. There is a nice trick, called implicit differentiation, that allows you to calculate the derivative of functions whose expression you don't know. And that's the next step from here: Implicit Differentiation.